These systems are capable of posting 200K - 800K PPD. Provide some organization to the wealth of good information, guides, and my lessons learned. My personal goals were to push myself into the Top 20 Producers for Folding@EVGA, maybe motivate my teammates to step up as well, force myself to learn about -BigAdv, Server hardware, and learn to spell Ubuntu. I'm certainly not an expert in this area. What works for me, may not work for you or your hardware. This represents about a month of nightly information gathering on the various source. I hope this save you alot of research time. All the prices are reasonable, thou you'll have to hunt to get some on them (Send me a PM, if you need help). You should watch these two thread for assistance: EVGA's AMD 4P Deals and [H] Hot deals for folders . *Add an Additional 200K+ PPD for the new 8102 - 8105 WUs. Check Power Supply Unit (PSU) section for Watts & PPD. At stock speed this rig is producing (~243K PPD w/ P8101, ~276K PPD w/ P6901, ~380K PPD w/ P6903/4) with an electrical draw of 460W. At stock speed this rig is producing (~125K PPD w/ P8101) with an electrical draw of 340W. Intel vs AMD. I was certainly bias to Intel and believed you only folder on just Intel and NVIDIA GPUs. I definitely thought I was looking at a Dual Xeon setup with an SR-2 motherboard. Xeon CPUs are changing over from the older LGA-1366 socket to the new LGA-2011 socket, the older can't measure up and I didn't want to put money into SMP 16 core system at would struggle to meet the new -BigAdv deadlines. 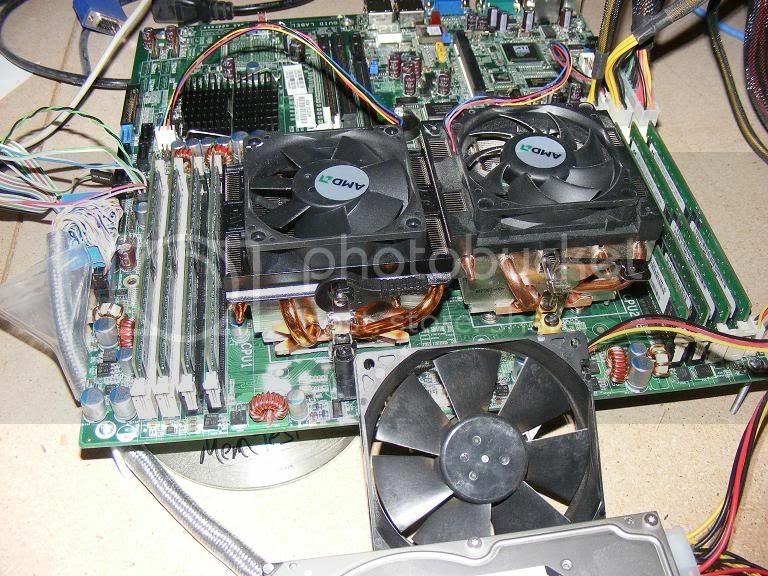 The LGA-2011 CPU are very expensive ie $2,000 per processor and no overclocking motherboard at this point (June 2012). The several debates about the two series, I believe the general thoughts are 6200 IL are newer, faster, have more cores and more expensive BUT don't fold as well as the older 6100 series core for core. The 6100s are starting to be life cycled out of the big high end servers, thus makes for a larger supply on the used markets like Ebay. More details AMD 6100 vs 6200 Debate reference. *EDIT 9/1/12* QuickZ's thread on Improve Opteron 6200's performance (and PPD) by using TurionPowerControl is new information since I looked at this decision. *EDIT 7/30/13* Since the original post, I now own a set of 6272 IL CPUs. I can say, even thou they have 64 cores (instead of 48 cores set of 6172 MC), they produce less PPD at the same clockspeed and use an additional 100W to run. Maybe this will change with future WUs, but all the 8101 - 8105 series do not. I would not recommend for folding over the MC. Here is how I thought about it. I could get an AMD Opteron 6166HE with 12 cores for $340. I couldn't even get a Intel (because I think Intel in the PC world) Hexa / Heca / 6 cores CPU for that price. Intel i7 (970, 980, 990) all costing over $400 on eBay market. I'm sure we could debate of HyperThreading compared to AMD native cores, but the deciding fact was you can't run dual or multi socket motherboards with the Intel i7 (970, 980, 990) only Xeons. IT Creations, Sales Manager (Jay Tessel ( IT Creations, Inc ) (jay@itcreations.com) and telling him your with "Stanford's Folding Project"
In the 4 Processors (4P) / Quad Socket / MultiProcessor (MP) Motherboard, there not a lot of choices the two main ones are TYAN S8812 (S8812WGM3NR) and SuperMicro H8QGi / H8QGL / H8QG6 series. to overclock the CPUs, I saw posted claims 30% overclocks or better. I picked SM H8QGi+-F because of the price and CPU socket placement, I felt it would be easy to cool than the cheaper SM H8QGL. I did not consider the H8QG6 series due to the added cost of SAS controller that I didn't need. Additional information on the different board series. - Socket placement was good for cooling. - Embedded graphics card (no need to buy one, also add a video card could hamper cooler by blocking the CPU cooler). - Motherboard works with just one cpu and would allow you to continue to upgrade by adding addition cpus over time. This was a big advantage over buying a 2P (2 Processor / Dual Socket) motherboard at 65% of a the cost of a Quad socket board. - Although I don't recommend this, but you can theoretically use different / mismatched CPUs on the board. It will just drop the overall CPU speed down to the lowest common denominator. - Biggest benefit is the ability to get great support for the folks at the [H]ardForum. The folding support has just gotten better and better over the year, several members of the EVGA team are now running multiple AMD 4P systems. Still high recommended to buy SuperMicro 4P motherboard over other brands. The AMD 6100 series CPUs has an integrated quad-channel DDR3 SDRAM Memory controller. This translates for optimal performance each CPU needs 4 separate memory sticks. You need to check your motherboard manual, but Error-Correcting Code (ECC) memory is common place on server motherboard. ECC memory is more expensive and slower than the traditional non-ECC memory common to desktop computing. In this case both the Tyan and Supermicro can be used with non-ECC memory. You also have to look at of the memory voltage, once again defer to your motherboard manual, you need the 1.5v memory for the Supermicro. You'll also want memory with XMP profile. If you think, you would like to overclock in the future, you're going to need fast memory. If you don't overclock you could save some dollars here. Background: Server boards are design more or less for Data Centers, where cool air is rapidly circular thought the case, with the smallest height and foot print as possible. Rack mounted Data Center devices are generally avoided in the home environment for several reasons. Most folks don't have a server rack at home, they can take up alot of space, but the main reason I believe is the noise levels of the fans. These Data Center devices fans are design to pull high volumes of cool air thru the device and are very loud and typically not user adjustable. How Loud? Take your vacuum cleaner in the closet and turn it on and close the door. If you and significant others are OK with the sound volume, ignore this warning. You basically have 3 options, with various tradeoffs of Cost / Time / and Cooling Effectiveness. Use standard server heat sinks. Typically what is used in Data Center deployed servers and normally consist of a copper block heat sinks (~$50 per CPU). Custom Modify the Motherboard or PC CPU Cooler to fit (large range of cost, but starting ~$20). - Option 1 - Modify the motherboard (and Yes I understand it cost over $650 dollars) with a #6-32 Tap tool to cutting the threads thru the motherboard post inserts, thus enable you to use standard #6-32 x 1.5in bolts to be screwed in from the bottom side of the motherboard. - Option 2 - Take #6-32 x 2in bolt an cut off the heads (creating a threaded rod) an insert the by hand screwing it into the motherboard post inserts. I chose PC CPU Coolers route and selected Refurbished Cooler Master Hyper 212+, that where recommended for overclock and good value ($12 per CPU). I went with Option B and Option 1, where I modified the motherboard tapping the thread thru the post and used #6-32 x 1.5in bolt screwed in from the bottom of the board. I followed Musky's CM Hyper 212+ - Alternative G34 Mounting Method. The only exception, I didn't use the springs on 2 post to the motherboard, but just a #6 lock washer an #6-32 standard nut. Due to the space constraints you can only turn the nuts about a 3rd of a turn with a wench. I didn't use the nylon threaded nuts here for that reason. Special note - These CPU Coolers are tall and you'll need to take that in to consideration if you want to use a case. 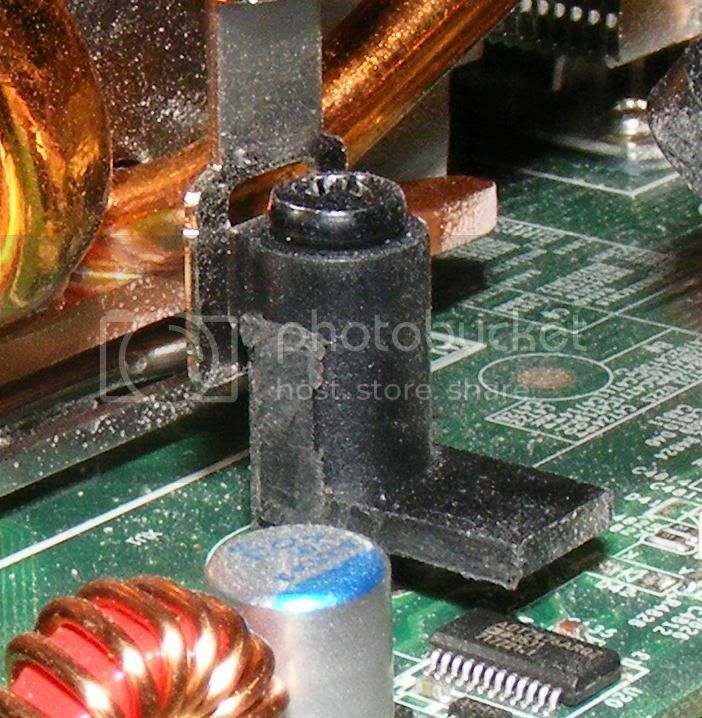 Some folks have voice concerns over the CPU Cooler's combine weight on the motherboard in a vertical / upright position, I personally would think it fine, but again wouldn't recommend using the springs on the mounting to the motherboard post. I use Zalman’s Super Thermal Grease (STG) that is brushed on like a nail polish. I'm done with the tube / paste and using a credit card to smooth it, I never seem to get it just right, it's either too thick or too thin. Just brush it on the heat sink and CPU and it has been very consistent. Special note - AMD G34 / Operton CPU are significantly larger than the standard PC Intel chips, the heat sink doesn't cover the whole ship, so there no need to cover the whole chip. I was able to do the install of all 4 CPU with a single bottle, but your mileage may vary. If you are using the recommended [H] folding Appliance, everything is already loading to a ram disk. This allows booting off a USB thumb / flash drive to work just as well as a physical hard drive. Booting from a USB device will take an additional minute to boot, but your not going to see any real difference in PPD at all. It does have an advantage of using less energy as well as the drive and cables block air flow. That said a standard hard drive or SSD will still work fine. Recommend USB that's been tested. Patriot Memory Supersonic Boost XT USB 3.0 8GB Flash Drive (PEF8GSBUSB) using USB 2.0 (Read 37.2 MB/s Write 13.0 MB/s). I'm using SanDisk Cruzer Fit 8GB original because of Plug and Forget, but discovered it's much slower performance (Read 23.1 MB/s Write 5.2 MB/s). Special note - If you doing you own manual installation, you could also try playing with the IGMI management interface (which is a BIOS supported KVM over IP) and virtually attach to a DVD drive across the network for the installation. Detailed reference Penn7's post Supermicro IPMIview Review – Remote Server Monitoring and Management and KVM-over-IP. I had an OCZ ModXStream Pro 700W on hand, so didn't put much thought into this decision. At stock CPU speeds and no dedicated graphics card I'm pulling 440W - 460W from the wall. Overclocking 10% pushed to 480W of consumption. I've seen post with folks using AMD 6180 CPUs and large overclocks pulling 800W - 850W. If you buying a PSU I'd recommend one that is EPS12V 2.92 version, I believe all 850W and above units come standard with 2 8-pin CPU / EPS connectors. Alot of smaller PSU come with 1 8-pin & 1 4-pin ATX12V / EPS. The 4-pin (inserted in the motherboard 8-pin connector) provides enough power to boot the system and do the installation, but you're not going to be able to fold under that setup. Other options would be to use an adapter converts 2 4-pin molex connectors to feed the 8-pin CPU / EPS connector NOT RECOMMENDED or a 4 Pin Male to 8 Pin Female EPS Power Cable Adapter or a PCI-E (6+2) to 8-pin EPS. I used the adaptor (2x 4-pin Molex to 8-pin CPU / EPS connecter) on my system and it seems fine for stock speeds, but I've had alot of difficult with overclock and I'm looking into this as a possible problem. EDIT We are definitely seeing reports that the CPU / EPS sockets are capable of pulling more power than the molex wires can handle. For more details read Patriot's post on 4p Power advisory. EDIT After upgrade the PSU to a EVGA 1200W (that has 2 CPU / EPS connectors, I've had no problems with the overclocking. My 6166HE default clock is 1.8 GHz now running 2.3 GHz. Detail reference Bowlinra's post AMD 4P Burning and Prep for OC? Power draw will vary based on the component in the system, Project WUs and amount of Overclocking. Using Kill-A-Watt , CM 212+, USB Flash drive for Boot, No other drives or case fans. Special note - Consider going with Gold or better rated PSU, this could reduce the electric cost by 10 - 20% for me at a relative low rate of .10 per KWh that's an $40 - $80 annual savings. Case or run Naked (w/o a case). That is the question. I still have mixed feelings on this one. I guess my visions of granduir lead me to think, I might have more than one of these setups, needing some form of a wooden homemade rack. (EDIT 7/20/2012: I did build a homemade rack guide on a separate thread here Home Rack Garage Build - Beating the Folding Heat of Summer). I also had concerns with the weight of the CPU Coolers on a vertical mounted motherboard. I'm not so concern with this anymore (see note in the Heat sink / CPU Coolers section). I also thought the heat displacement would be better horizontally placed. Tanner2's ARG..... not another one of hese posts!! David12857's New member of the EVGA 2P family. Please send me a PM, if you have additional good pictures post to include. Note the fahinstall setup the /fah directory to run on a ramdisk, so once your passed the initial boot and fah start, there is very very little hit on slow disk performance. Which make running on a 8GB USB thumb drive, cheap (under $10) and very little power required. Also the ramdisk does provide another 10+% PPD over traditional method. It took me ~25 mins to write the image to a 8GB USB stick and under 15 mins to shutdown (sudo poweroff), swap drives, reconfigure fahinstall and back up and folding. If your running several rigs with the [H] Appliances let me know, I've got another script to make repeated setup even simpler. Complete details are found on the link below. Definitely will be an excellent reference for our Team and thank-you for putting it together for us! I thought they made server racks with multiple server trays in them, so you could run anywhere from 2 to 16 servers? Do they make a smaller version of a server rack that can maybe hold 4 or so server trays? In my area space is limited. So If I were to do a 4p build it would have to go in a case and be verticle. So the water cooler option would probably be the best for me. But then I'd need a new case to fit such a beast. We need to compile a list of any cases that will fit these monster boards with little to no modification if possible. Very nice job so far bowlinra. @NerdGZ, what kind of themps do the stock Phenom coolers give you? Also @ Barbarossa, what water blocks are you using on your board? And one final side note, Operon 6128 8 core CPU's are currently going for $165 or so on fleabay. For those of us that are wanting to do this on a faily tight budget. And yes I realize that budget and 4p machine don't go together so well. @zophar 40ºCelsius with a 20mm 800rpm splitted over the heatsinks memory and with a 80mm fan on the bare metal behind hdd connectors. This solution is noisy aprox 3600 rpm fans from the 2 Phenom II X4/x& are spinning. Note to add to the post these Opteron CPU dies at 70ºC and over 54 -55ºC the CPU autoprotects them and does a shutdown/reboot. I have seen one at 50ºC but after removing the cooler fans and do a clean i was at this temperature. This deffinately needs to moved to the Help and Guides section. Great work. NerdGZ, I'll be glad to add it, Could you add some word explaining what you did, why and how for example.. It's not clear how and what you did from the pics, maybe because I'm not familiar with the stock version of the Urlauber 2P. We need to compile a list of any cases that will fit these monster boards with little to no modification if possible. I have might have some more information, but most of it posted, just not organized well for cases information. I've mounted my to a board and will be adding the write up after some vacation. I haven't looked into water setups at all, maybe Barbarossa or someone else can work up a "How To" and some cost numbers. Could you post a reference link? I certainly haven't heard this with the Opteron 6100 series, I understand they start down clocking at 70ºC. Also what kinda of PPD are you getting out of the 2P setup?